Our 3M(TM) Stikit(TM) Green Disc Roll contains durable, fast-cutting abrasive discs for aggressive collision repair jobs. Discs feature fast-cutting aluminum oxide abrasive built on D-weight paper backing. Multi-hole construction helps clear dust from the disc surface. Stikit(TM) discs feature adhesive backing for fast, easy change out. 5 holes for dust-free sanding. Use for shaping plastic filler, removing paint around damaged area and scratch refinement of bare metal. Suggested backup pad 05655. Our 3M(TM) Stikit(TM) Green Disc Roll contains durable, fast-cutting abrasive discs for aggressive collision repair jobs. 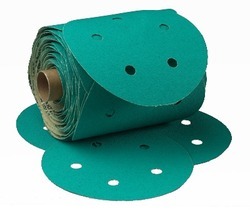 Discs feature fast-cutting aluminum oxide abrasive built on D-weight paper backing. Multi-hole construction helps clear dust from the disc surface. Stikit(TM) discs feature adhesive backing for fast, easy change out. 5 holes for dust-free sanding. Use for shaping plastic filler, removing paint around damaged area and scratch refinement of bare metal. Suggested backup pad 05655. Suggested backup pad PN05655. Can be used with 3M™ Random Oribtal Sanders.